Losing WeChat data on your iPhone is never easy even when you do have a backup. There is always the initial panic when you wonder whether you will be able to get the WeChat data back. If you have lost your WeChat messages and known how to backup WeChat to iCloud, then you have the chance to recover WeChat messages from iCloud. Because iCloud will also back up your WeChat messages automatically, The following texts will guide you in several effective ways you can easily get your WeChat messages from iCloud back. 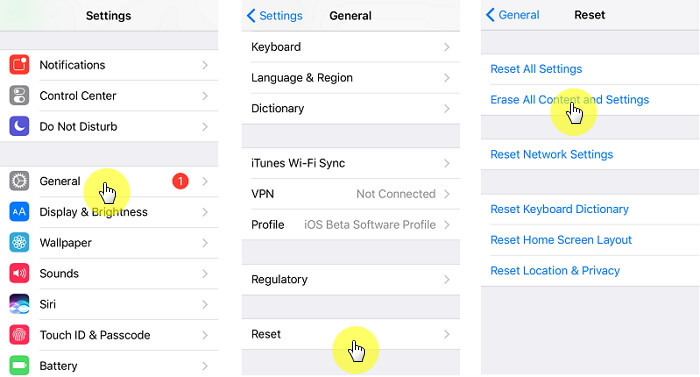 If you simply restore wechat history from icloud you have, you may have to erase all contents and settings from the device before you can restore from a backup. And you can not choose to restore only WeChat messages from backup. Furthermore, iCloud will back up not only the current WeChat data but also the deleted one, you cannot see the hidden data by restoring the iCloud backup. But with an iCloud data recovery tool like iMyFone D-Back, the problem is eliminated. This is because D-back allows you access to the data on your iCloud backup, so you can then just simply transfer the messages you need to your device. We are going to be looking at how to do that in a short while. But before we do, the following are some of the features iMyFone D-Back has that make it an ideal choice. 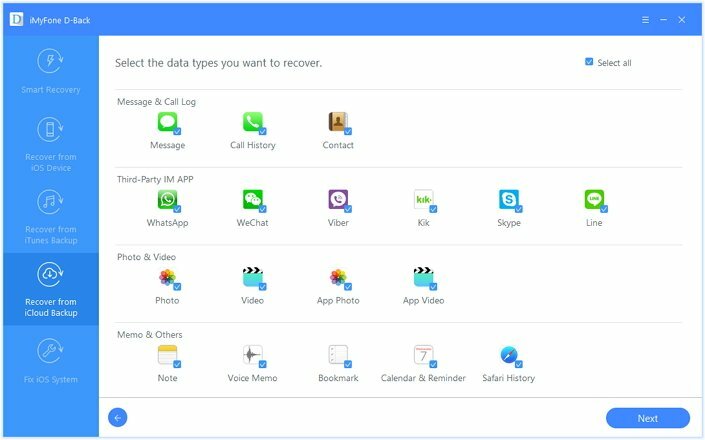 It can be used to recover more than 22 different types of data including messages, photos, videos and even third-party data. It can be used to recover data from iPhone, iTunes or iCloud backup file which is ideal when you have a backup but don't want to restore the device just to get back the WeChat messages. It is fast and effective. You'll have your recovered messages in just a few minutes. It offers free trial version allowing you to preview WeChat and other data types for free. To begin download and install the program to your computer. Once it is properly installed, follow these simple steps to get your WeChat messages back. Step 1: On the program's main window, select "Recover from iCloud Backup" and then click "Start." Select "WeChat" as the type of data to recover and then click "Next." Step 2: Next, you will need to sign in to your iCloud account before selecting a backup file. Click "Next" to proceed. 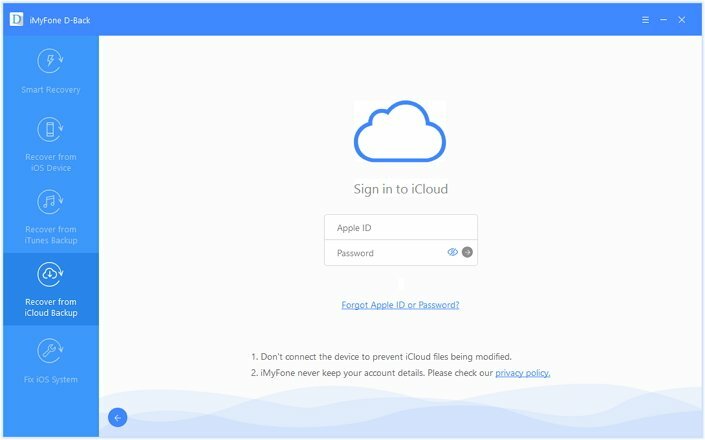 Please turn off two-factor authentication before login to make sure you can sign in to iCloud successfully. Step 3: Select an iCloud backup from the list to start the scan process. Step 4: The program will analyze the selected backup file and display the current and deleted WeChat Messages on it in the next page. Select the ones you want to recover and then click "Recover" to save them to your computer. Alternatively, you could also choose to simply restore the iCloud backup on an iOS device you already have or set up a new device from an iCloud backup and you'll have your messages back. Follow these simple steps to complete the process. Step 1: To begin, update your device to the latest version of iOS. You can do that by going to Settings > Software > General > Software Update. If there is an update available, follow the onscreen instructions to update the device. Step 2: You may also want to check to ensure you have the latest backup to restore from. To do that, go to Settings > Your Name > iCloud > Storage > Manage Storage and then tap on the iPhone under Backups to see the date and size of the latest backup. Step 3: Once you are certain you have a backup, erase all contents and settings on your device. to do this go to Settings > General > Reset and then tap "Erase All Contents and Settings." Step 4: On the "Apps & Data" screen, tap "Restore from iCloud Backup" and then sign in to iCloud. 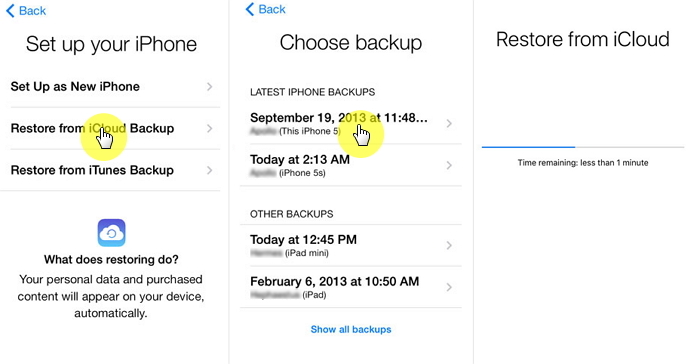 Step 5: Tap "Choose Backup" and then select the latest backup from the list available. Keep the device connected to Wi-Fi until the process is complete. 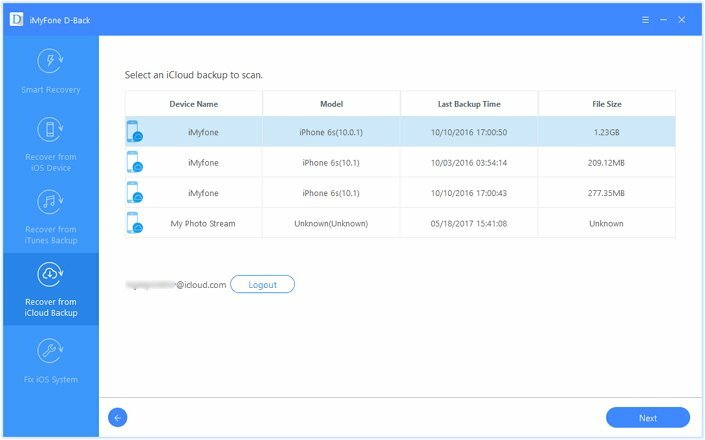 If you are switching devices, moving your data from your old device to the new one has been made very easy by iCloud backups. All you have to do is set up the device from the iCloud backup. Here's how to do it. Step 1: Turn on the iPhone and then follow the instructions on the setup screen of your new iPhone until you get to the Apps & Data Screen. Step 2: from the Apps & Data Screen, tap on "Restore from iCloud Backup" and then sign in to iCloud. Step 3: Tap "Choose Backup" and select the latest backup from the list and simply wait for the process to be completed. While it may be simple to simply hit "Restore" and have all the data in an iCloud backup restored to your device, there may be several problems with this method. They include the following. First, the process requires that you erase all contents and settings before you can restore the backup. This means that any new data that was not on your backup may be lost in the process and may never be recoverable. It is also quite a lengthy process. Depending on the size of the backup, the process may take hours to complete. It is quite prone to issues. There have been many reported instances of error during the process and failure of the process to complete among other issues.